Create a grid that is about 15X15 yards. Adjust the grid bigger or smaller depending on the age and number of kids you have. You will need to have a ball for each player; however, only three players start off with balls. Place the remaining balls outside the grid. The three players with balls are called the "hitters." The remaining players should start off scattered throughout the grid they are the "dodgers." 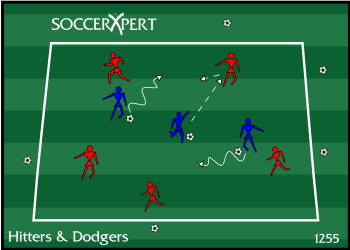 Instruct the"hitters" to dribble inside the grid and attempt to pass the ball to any of the "dodgers" and hit them with the ball. The "dodgers" are attempting to avoid being hit by the "hitters". If a "dodger" is hit, he must collect a ball from the extra balls outside the grid and join the hitters. The last players standing win. Coaches should talk to the hitters about keeping their ball close to the while getting their heads up to find the dodgers. Coaches should focus on good passing form: using the inside of the foot with good pace on the ball.